A CT scanner is like a narrow doughnut with a moving table passing through the centre. CT uses X-ray equipment that rotates around the body to obtain image data at different angles. Processing of this data by a computer results in a cross-sectional image of body tissues. It is not a claustrophobic experience, but should you feel that you are likely to be anxious, your GP may prescribe a sedative to take prior to the procedure. Most patients do not require any sedation. 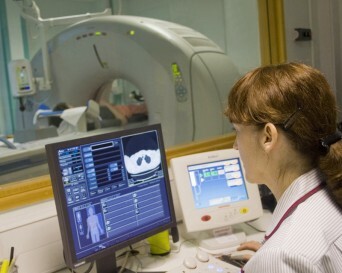 The whole examination is likely to take about 15 minutes, although the scan itself lasts only a few seconds. CT is one of the best methods of visualising the brain and the organs and tissues of the chest and abdomen. It is useful in diagnosing cancers, infectious disease, inflammatory disorders and trauma. It can also be used to diagnose coronary artery disease and to screen for some types of cancer eg lung or bowel. CT demonstrates bony detail well and may be used to diagnose and assess fractures, to measure bone mineral density for the diagnosis of osteoporosis, and for the evaluation of the ear and sinuses. CT can help to guide biopsies of abnormal areas of the body without the need for an operation, and also for other minor procedures such as drainage of abscesses or fluid collections, all done under local anaesthesia. You will be advised of any necessary preparation for your scan when you receive your appointment. You may be asked not to eat or drink, or to take laxatives if you are having CT colonography. A CT examination commonly requires the injection of intravenous contrast agents to improve the visibility of the blood vessels and soft tissues. You will be asked about any history of asthma, diabetes, heart disease, thyroid disorder or allergy prior to administration of iv contrast, as rarely patients may develop an allergic reaction. Should this occur, radiology staff are trained in treatment of such a reaction. You may also be given contrast to drink prior to your scan to aid visualisation of the bowel. Occasionally contrast needs to be administered via a tube introduced through the nose into the stomach and small bowel, or through a rectal tube, for specialized CT scans of the bowel. The typical radiation dose for a CT examination is equivalent to the amount of natural background radiation received over a period of one year. You should tell the staff if you are, or think you may be, pregnant as CT is best avoided within the first trimester, unless absolutely essential.